Five to ten percent of all pediatric tumors are associated with a genetic predisposition. 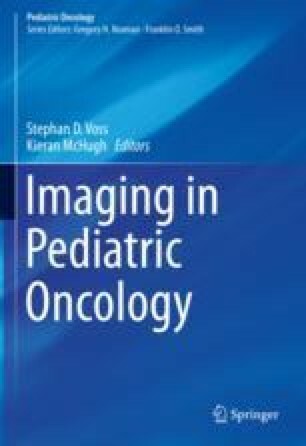 In this chapter, we will discuss the main imaging examinations used in the evaluation of specific cancer predisposition syndromes (CPS) including Wilms’ tumor predisposition syndromes, Li-Fraumeni syndrome, and neurofibromatosis type 1, as well as more rare syndromes that have specific features, including DICER1 mutations, familial paraganglioma syndromes, and multiple endocrine neoplasia syndromes. Currently, ultrasound (US) and whole-body MRI (WBMRI) are the main modalities utilized for tumor surveillance in these children with cancer predisposition syndromes. Contrast-enhanced ultrasound and WBMRI with positron emission tomography (PET) are emerging as adjunct imaging tools in oncological imaging. In our discussion, we will also highlight the advantages and limitations of US and WBMRI and emphasize the importance of expert imaging interpretation and appropriate communication to clinicians and families.